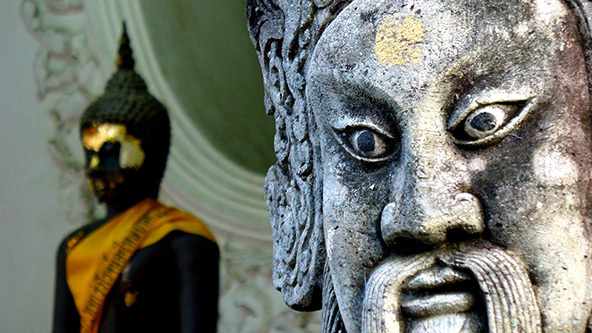 Bangkok’s temples are an integral part of the heart of the Thai capital. In order to immerse yourself in the true local culture, then you should visit some of them. The inspiring architecture presents complex structures covered with thousands of pieces of coloured glass and ceramics. The golden phra prang (towers) bedazzle with their shine under the sun, surrounded by chaotically built residential buildings. The best time to visit the temples in Bangkok is early in the morning, when the hot and sticky weather is a little more bearable. The temples are not only a tourist attraction, as they still play a very important role in the religious life in Thailand. Most of them are still inhabited by monks, who perform important religious rituals every day. Early in the morning, tourist can witness an important ritual performed by monks, called Tak Bat. In this ritual monks dressed in colourful shafron receive donations from citizens in the form of food and clothing and in return, the monks bless them. This is an important part of the Buddhist philosophy of giving and receiving. It won’t be an easy task to see all attractions in city that occupies 1,568.7, this is why we came up with a list of the must-see temples, with the biggest cultural presence in the city of smiles. 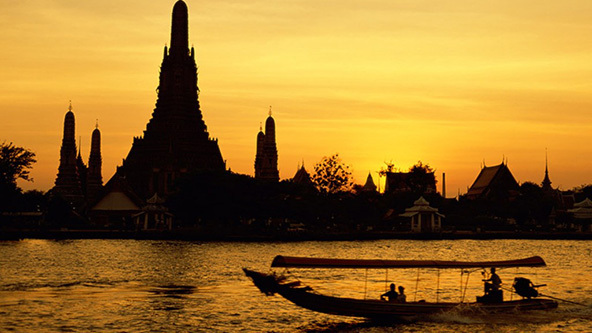 Wat Arun is one of the most revered temples in Bangkok. 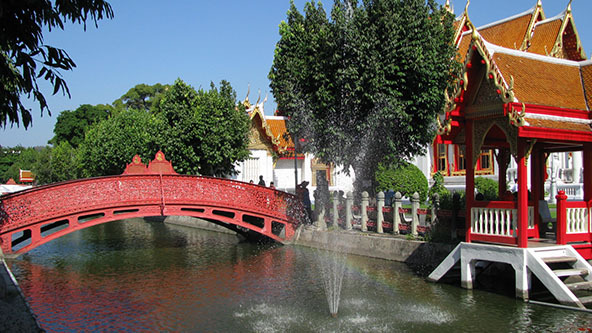 Located on the west bank of Chao Phraya River, the temple is part of a huge complex, consisting of lakes, alleys, smaller temples and dazzling white buildings. It is best known for its stunning towers that are covered with thousands of coloured ceramic pieces. The construction of the temple is dated back to the reign of King Pama II and is completed during the reign of his successor, King Rama III. Tip: To be able to capture the magic of the Temple of Dawn , try to visit it during the sunrise or sunset. Location: 34 Arun Amarin Road, Wat Arun Kwang, Khet Kangkok Yai. Phra Pathom Chedi, which literally means “first stupa”, is the tallest stupa in the world. With the impressive height of 127 meters, this fascinating building is located on the grounds, where Buddhism was first introduced in Thailand, more than two thousand years ago. The first written evidence about the temple are dating from the year 675. 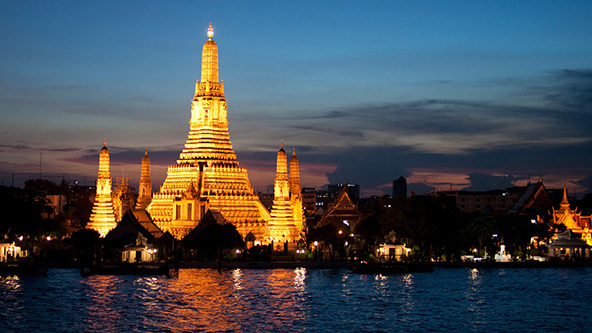 Tip: Visit Phra Pathom Chedi in November, when the annual fair takes place. It coincides with the twelfth month in the Lunar year. 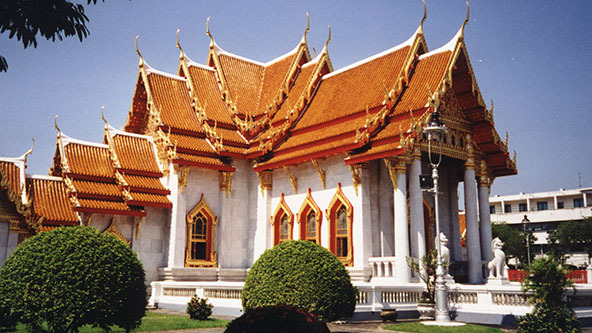 The Marble Temple is one of the modern and most impressive temples in Bangkok. The architecture of the temple was designed by the brother of the King – Prince Naris. 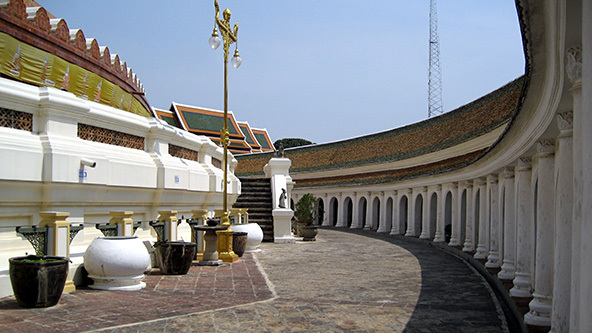 The outer part is covered with a dazzling, white Italian marbel and the three leveled roof is an excellent example of the modern Thai architecture. The garden of the temple, there are 52 Buddha statues, brought from all over the world. Each statue has a different different style and posture. Tip: In the back of the temple there is a Bodhi tree – sacred fig tree (Ficus religiosa), bought as a gift for the king. It is believed that Buddha received his spiritual inspiration under a tree of this kind.